Saxo Bank's June figures were pointed higher, with its FX figures registering levels not seen since the SNB crisis. Saxo Bank, a Danish multi asset broker, has reversed its monthly downtrend, helping pare some if its recent losses en route to a stronger month during June 2016 – additionally, key metrics at Saxo Bank reached yearly highs, including its client collateral deposits, according to a Saxo Bank statement. Saxo Bank’s 2016 volumes have been a mixed bag, waxing and waning throughout H1 – generally speaking the trend has been lower, after peaking at a yearly high of $12.9 billion in average daily foreign exchange (FX) turnover in January 2016. This gave way to an oscillating movement of volumes that ultimately grew during June 2016, climbing to $11.9 billion for the month. The increase in trading volumes at Saxo Bank came despite the substantially increased margin requirements during the Brexit event. Clients of the Danish multi-asset brokerage have also managed to secure over €200 million in profits over the course of the massive volatility around the referendum on June 23rd. This does represent a growth of 2.6% MoM from $11.6 billon set back in May 2016. Despite rescinding volumes last month, the group’s recent figures haven’t approached the yearly low of $11.0 billion that was seen back in March. Across a yearly timetable, Saxo Bank’s latest FX turnover in May 2016 was more upbeat, with a YoY growth of 8.2% from $11.0 billion in June 2015. 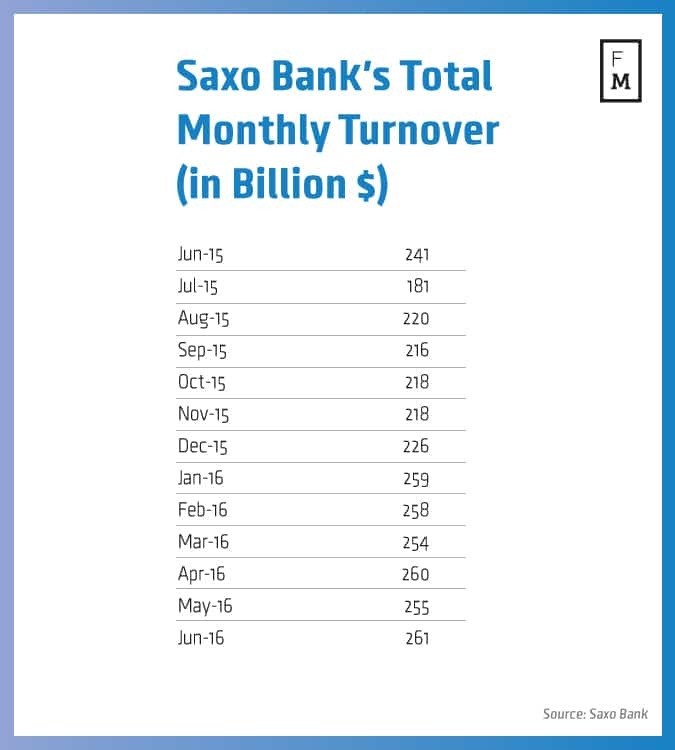 Furthermore, Saxo Bank’s total monthly volume also moved higher; climbing tepidly to $261 billion in June 2016 from $255 billion in May 2016 – this yielded a movement of just 2.4% MoM, though it did reverse and eliminate last month’s losses. Extending this analysis to a yearly interval, the latest figures also orchestrated a growth of 8.3% YoY from $241 billion in June 2015. Despite a pronounced movement, June 2016’s total volumes were the highest at Saxo Bank since January 2015, when the Swiss National Bank crisis enveloped the industry. Finally, Saxo Bank’s client collateral deposits continued their steady rise into June 2016, inching higher to $12.25 billion in June 2016, up by less than 1.0% MoM from $12.22 billion in May 2016 – this figure has risen in every month of 2016 and is currently operating at an all-time high.